This coffeemaker has retro styling and the latest in high tech features. 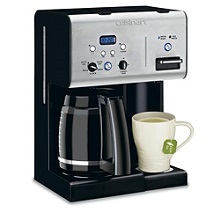 The Cuisinart Brew Central programmable coffeemaker is reminiscent of the days of durable materials. Includes a charcoal water filter which ensures great tasting coffee by removing impurities from the water. Programmable digital clock with 24 hr. advanced-brew setting. Audible beep that signals the end of the brew cycle. 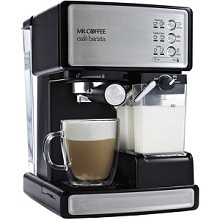 The Mr. Coffee Single Serve Brewing System uses Keurig K-Cup packs for single-cup brewing (including tea flavors, cider, hot cocoa and assorted coffee flavors). Brews 6, 8 and 10-oz cup size in under one minute with its pre-heated water chamber. 40 oz removable water reservoir. Dimensions: 10" L x 13" W x 12.5" H.
Enjoy yor favorite beverage any time of the day or night. Enjoy espresso or cappuccino at the perfect temperature with two separate thermostats. If your preference is cappuccino you'll enjoy using the swivel jet frother for perfect drinks every time. High quality stainless steel boiler to ensure many years of use. Easy to clean with removable water tank and drip tray. Dual function filter holder; you can use ground coffee as normal or convenient coffee pods for faster preparation. Dimensions: 7.5" x 9.5" x 11.12"
Camping can be a lot of fun but you still want your morning cup of coffee. This camping coffee maker by Coleman is designed to sit atop a Coleman two or three burner camping stove. Includes all the standard coffemaker features such as swing-out filter basket, solid steel base and an easy-pour decanter. Offers a pause-and-serve feature so you can interrupt the brew to pour a cup of coffee. Brews a full pot in roughly 10 minutes. Use for tea or hot chocolate as well. Uses standard 10-12 cup basket filter. 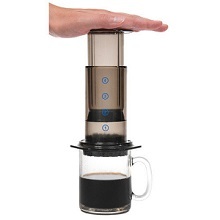 The AeroPress Coffee and Espresso Maker is a 1 to 4 cup hand press coffee and espresso maker. Comes with a funnel, scoop, stirrer and 350 micro filters. Takes about one minute from start to enjoying your cup of coffee or expresso. Makes American style coffee or brews espresso style coffee for use in lattes, cappucinos and other espresso based drinks. Clean-up is quick and easy. Make tea with the upside down or inverted method. Dimensions: 6" H x 4.25" W x 3.75" D.
Makes coffee with very rich flavor. This is an impressive stainless-steel electric tea maker. 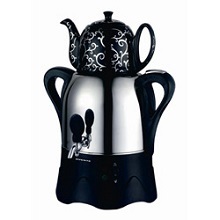 The stunning black and silver ceramic teapot sits atop the kettle. Indicator lights for boiling and keep warm. Dimensions: 12" L x 9" W x 15" H.
Interior and exterior water-level for easy filling. Teapot lifts off; does not come with strainer. Create custom coffee drinks like your favorite coffeehouse. The Barista brews espresso coffee with a 15-bar pump system and automatically froths milk into cappuccino and latte selections. 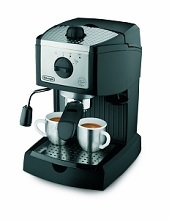 This espresso maker is a semi-automatic 3-in-1 espresso, cappuccino and latte maker. Easy-fill, removable water and milk reservoirs. One touch control panel allow yout to choose from single / double-shot of espresso, cappuccino,latte. Create delicious coffee drinks from raspberry cappuccinos to espresso martinis to choco-nutty lattes. Recipe guide loaded with 20 different delightfully delectable recipes comes included. 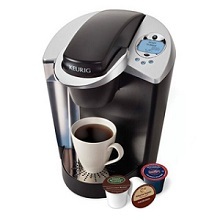 Whether you want tea, coffee or hot chocolate the Keurig K65 will prepare it for you with just a push of the button. 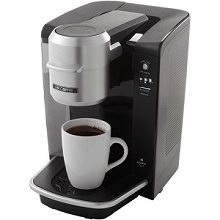 Features a quiet brew technology coffee brewer. Auto off mode for safety and energy savings. Removable 60 oz. water reservoir. Everyone in the family can have a different cup of coffee quickly. Get one for your home and your office. 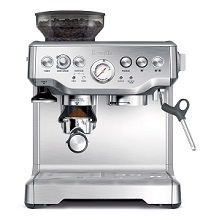 Thanks to the Breville Barista Express integrated burr grinder you can go from beans to espresso in under a minute. No more tradeoff between taste and convenience. In addition, this coffee machine has an Italian-manufactured 15 bar pump and thermocoil heating system that ensures accurate regulation of water temperature for a full-flavored espresso. 67 fl. oz. (2L) removable water tank with handle. Stainless steel conical burr grinder with 1/2 lb. sealed bean hopper. Grind size and grind amount selector dials. Colors: stainless steel, black sesame and cranberry red. Get that morning coffee with this versatile programmable coffeemaker. The gold-tone filter removes water impurities for a better taste. Automatic cleaning feature means less scrubbing. Fully automatic with 24-hour programmable option. 12 cup carafe that has a drip-free pour spout and a comfortable handle for easy serving. Carafe temp control offers a heater plate with high, medium and low settings to keep coffee at your preferred temperature. Blue backlit LCD with digital clock to make display easy to read. This Keurig K-Cup coffeemaker is easy to use; simply add water for each cup, insert your coffee and select your choice of 3 cup sizes. 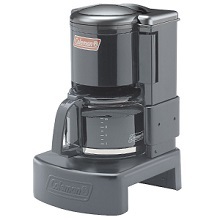 This coffeemaker is compact in size and ideal for areas where space is limited. Get one of these colors to coordinate with your kitchen appliances; red, aqua, blue, purple, banana yellow and platinum. 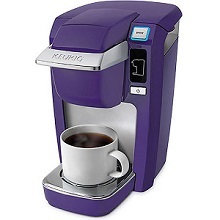 This Keurig K-cup Mini Plus Brewer is a personal brewer. Fully automatic brewing, piercing and ejection of used capsules with a retracting coffee outlet to stop dripping after coffee is brewed. 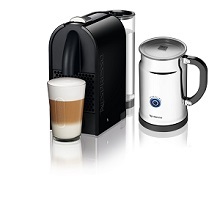 Includes Aeroccino Plus milk frother: rapid one touch preparation of hot or cold milk froth. Design allows you to rotate the water tank 180-degree around the machine. This espresso maker memorizes the preferred cup size. Auto shutoff after 9-minutes of inactivity. Light indicator for empty water tank / full capsule dispenser. If there is a new baby on the way then you probably have lots of needs and one of those is most likely a nice changing table with storage. There is a nice selection of baby changing tables at this site in different finishes. You want to be certain that you will be able to get out of your car in the event of a accident especially if the accident causes a car fire or maybe an accident in which your car might be submerged in water. You may just need to break windows or cut seat belts to get out of a hot car after an accident. As the weather gets hotter you will probably need more ice at your house. A countertop portable ice maker can provide all that extra ice that you need when you need it. You may even need more ice if you tend to entertain a lot. During bad weather it is nice to have a backup power source when the utility company power fails. Check out these Portable Gas Powered Generators for Home Emergencies.